We've been enjoying Vacation Bible School at FBC Lockport this week. Kevin's Mom and our nieces are staying with us this week so they can enjoy the festivities as well. It's been a fun week. Kevin's Mom keeps Liam in the evenings so that I can help out with the kindergarten class. Silas is allowed in the class with me and Kamil is in that class as well. 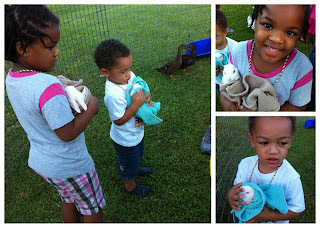 Yesterday we had a petting zoo for the kids. I got a few pics on Kevin's phone. Here are the kiddos with the bunnies.